The Government Inspector is a 19th-century farce by Nikolai Gogol, but Washington audiences won’t find it dated. Sadly, we can still be in thrall to demagogues and doublespeak, and those who make obscene wealth off the sweat of the poor (at least we don’t have serfs, right? Right?) When the corrupt officials of a remote town learn they are being secretly inspected by a government agent, their ridiculous attempts at cover-up would make a Watergate operative blush, let alone more recent shammers. Throw in a case of mistaken identity and watch them all squirm. 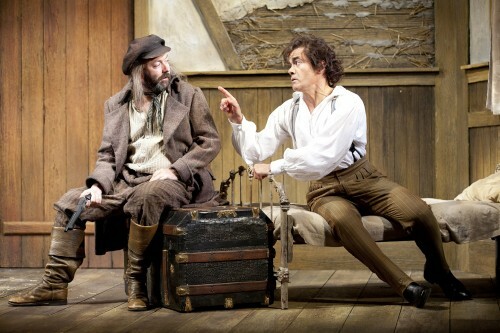 Liam Craig as Osip and Derek Smith as Hlestakov in the Shakespeare Theatre Company’s production of The Government Inspector, directed by Michael Kahn. Photo by Scott Suchman. Once the faux government inspector arrives in the person of a dissolute clerk, the scenery is deliciously chewed. Derek Smith struts and frets and preens with abandon as Hlestakov, indulging in the wildest drunken rant ever. At times a caricature of the Romantic anti-hero favored by Gogol’s friend Pushkin, at other times cavorting like a naughty Disney faun in Fantasia, it’s a daringly funny performance that energizes the ensemble as their characters maneuver for his attention. It’s a menagerie of eccentrics, which helps mask the fact that this farce is a bit slim on plot beyond the point that these grifters are about to get grifted. As the mayor, Anton Antonovich, Rick Foucheux is a delight, as if the Wizard of Oz fell into Russia and couldn’t believe his good fortune. Nancy Robinette and Claire Brownell, as his wife and daughter respectively, round out an unholy trinity of a family that marries Jane Austen with Tim Burton. Brownell especially makes a daring choice to inhabit the world of the grotesques, making the audience perfectly uncomfortable from her first entrance. Rather than amping up the dark eccentricity of Gogol, director Michael Kahn has chosen to highlight a bright absurdity. That’s apparent from the beginning with the sparkling production design of James Noone’s sets, Murell Horton’s costumes, and Philip S. Rosenberg’s lighting. A few plant their characters in the realm of the freaks (mostly a triple turn by Sarah Marshall), but overall the players have twinkles and winks in their eyes. It’s just a personal preference of mine to wish for more grime. Kahn’s choices are committed to fully by his ensemble, while adding a few moments of gravitas to show not all is dazzling in this corrupt world, such as with the honest simplicity of the bereft corporal’s widow (Marshall). Notably this also occurs with the groveling Tweedledee and Tweedledum act of Dobchinsky (Harry A. Winter) and Bobchinsky (Hugh Nees), whose desperation to be noticed and unctuous requests pinpoint an underlying tension, though the moment when the ensemble finally turns on them could use a ratcheting up of cruel cannibalism. When the real government inspector is unmasked, leering in cold triumph, it makes for a very satisfying checkmate. Retribution is on its way, at least, for this regime. History tells us it’ll all start up anew anyway. 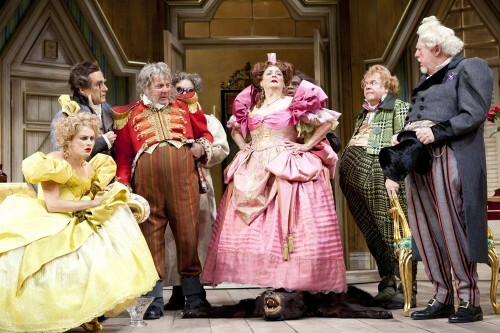 Shakespeare Theatre Company’s production of The Government Inspector performs through October 28 at the Lansburgh, located at 450 7th Street NW, Washington, DC 20004 . Closest Metro stop: Gallery Place/Chinatown (Red/Yellow/Green lines). For more information call 202-547-1122.